Linus Carl Pauling was a renowned scientist and peace activist who would become the only individual to be awarded two unshared Nobel Prizes (one for Chemistry in 1954 and the other for Peace in 1962). A native of Portland, Pauling attended Oregon Agricultural College (now Oregon State University) and Caltech before achieving international acclaim for his work with chemical bonds, molecular biology, and Vitamin C.
Pauling and his wife, Ava, would use this renown to further their support of international peace and human rights. Staunch opponents of nuclear weapons and Cold War policies, the couple would face widespread criticism for their activism—and also earn the respect of thousands. Biographer Tom Hager described Linus Pauling as “the greatest person [his] home state had ever produced,” a brilliant man who kindly “treated almost everyone like an equal.” This passion for science and concern for humanity blended to create a stunning, enigmatic man whose ingenuity would influence generations. Fellow Oregonians are invited to honor OSU’s most famous alum by sharing birthday cake this Friday, Feb. 27, from noon to 1 p.m. on the ground floor of the Linus Pauling Science Center. The Linus Pauling Institute also sponsored a cake and ice cream party held this Thursday, the proceeds from which will be donated to the OSU Food Drive. Those who are interested in learning more about the Paulings have several options. Scroll below to discover what resources the OSU community has to offer regarding one of the twentieth century’s greatest scientists and humanitarians. What: A concise, intricate biography that draws upon personal correspondence, sketches, papers, and recorded interviews. Never-before published items and pieces from the Ava Helen and Linus Pauling Papers archival collection offer intriguing illustrations and marginalia that add to the reading experience. For: Those interested in an accessible, multi-dimensional look at Linus Pauling’s life. 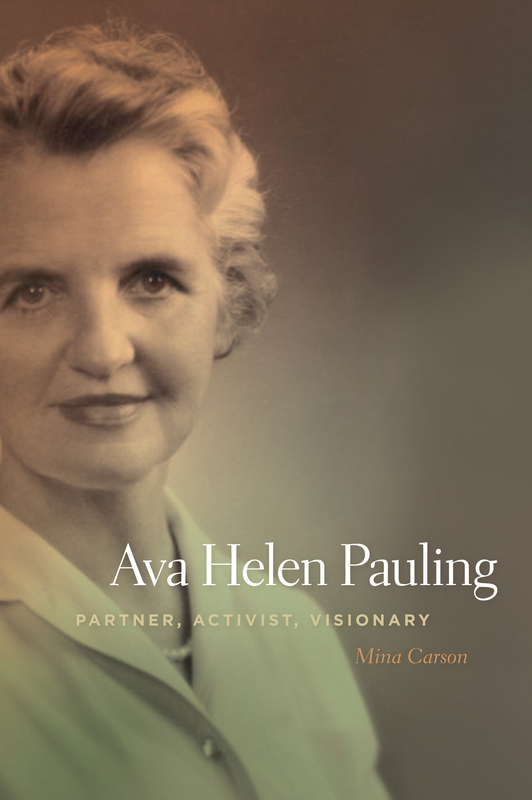 What: An overdue examination of Ava Helen Pauling, a dedicated activist and intellectual in her own right. The biography follows Ava’s balancing act of housewifery and a passion for movements that supported feminism, environmentalism, and global peace. 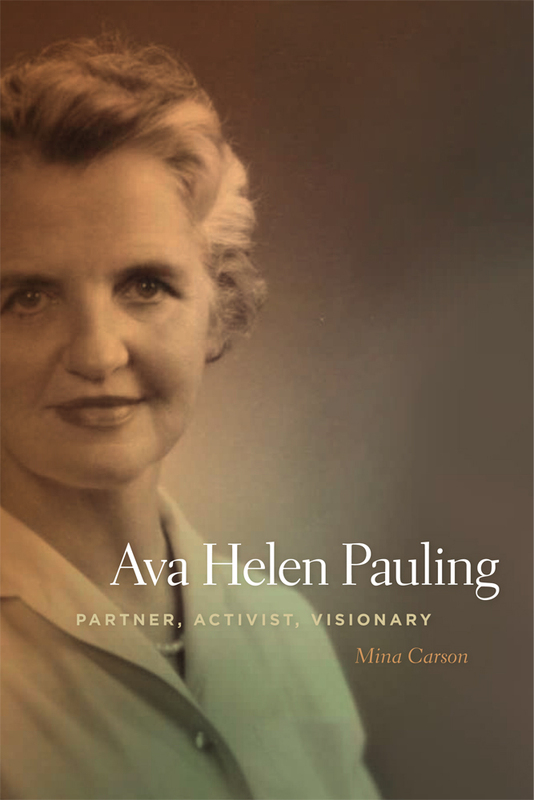 For: Those interested not only in the life of Ava Helen Pauling, but women’s and reform history during the twentieth century. What: Pauling’s guide to healthy living, first published in 1986. Suggesting simple and inexpensive daily habits like vitamin consumption, Pauling offers readers a regimen in order to be happier and stay healthier longer. For: Those interested in living a clean, healthy lifestyle or in the historical importance of Pauling’s work in nutritional science. Former governor John Kitzhaber resigned from his gubernatorial post last Friday in a published letter to Kate Brown, the Secretary of State at the time. Kitzhaber announced his resignation in response to investigations regarding alleged financial misconduct with his fiancée, Cylvia Hayes. Accusations against the pair bubbled to a boiling point just weeks after Kitzhaber began his unprecedented fourth term in office. Within the span of a single letter, Oregon lost a prominent politician, gained a new governor, and opened a groundbreaking chapter in state political history. Although Kitzhaber is not the first Oregon governor to have stepped down, he is the first to do so amidst such controversy and confusion. According to the Oregon Blue Book, four other governors have resigned since the territory achieved statehood. 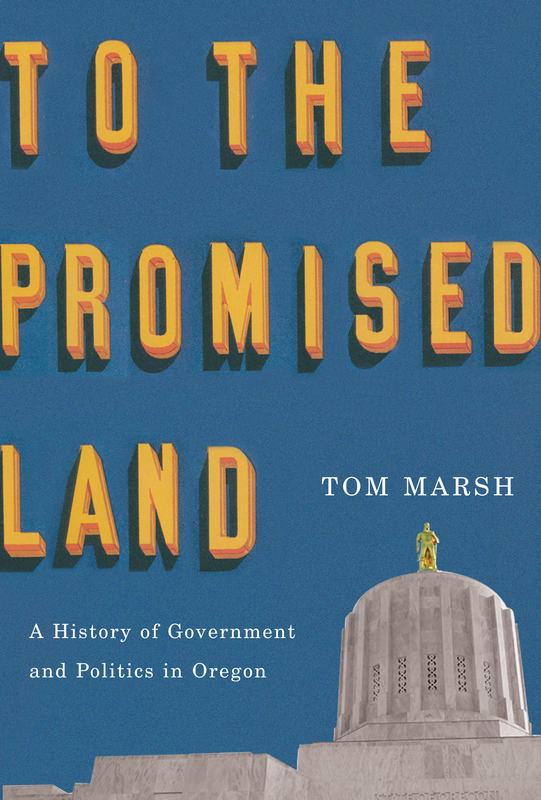 Marsh, a former state legislator himself, is the author of To the Promised Land: A History of Government and Politics in Oregon, published in 2012. Marsh’s work serves as the first comprehensive political history of Oregon, following important political figures and ballot measures throughout the state’s undulating social and economic narrative. An essential volume for anyone interested in understanding the foundations of the modern political climate, To the Promised Land places Oregon within the greater context of national politics. Oregon’s first female governor, Barbara Roberts, certainly knew a thing or two about progress during her governorship from 1991 to 1995. 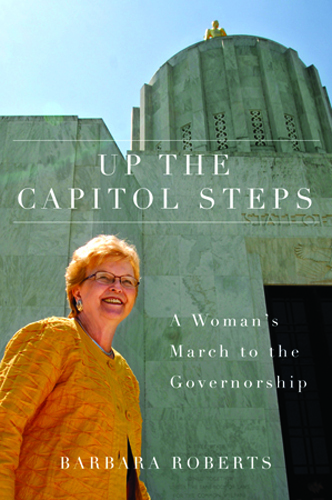 A “trailblazer in a state that knows something about pioneers,” as Sen. Jeff Merkley called her, Roberts recounts her story in Up the Capitol Steps: A Woman’s March to the Governorship. The book follows her own unlikely rise to power, documenting what leadership is like for a female in politics. Both To the Promised Land and Up the Capitol Steps offer readers a unique and timely perspective on the current period of upheaval. In order to fully understand the complications and consequences of today’s world, a reflective look backwards is often useful. You can purchase these items on our website by selecting the “Add to Cart” link on the respective book pages, or by calling 1-800-621-2736. *Kate Brown will be the third female to sit as acting governor in Oregon, according to information gathered by the Statesman Journal. Carolyn B. Shelton officially served as acting governor for one weekend in 1909 when her boss, Gov. George Chamberlain, left to accept a U.S. Senate position and his successor, Frank Benson, was too sick to be sworn in immediately. Her unique position resulted from a small clause in state law that required a governor’s private secretary to become acting head of state in times of absence or illness. Ironically, it would not be until 1912 that women were given the right to vote in Oregon. Most personal secretaries at this time were male. It’s raining. It’s pouring. The old man is snoring. And you? You, my friend, are searching for a book with which to curl up by the fire. You’re looking for the perfect title to alleviate the drudgery of a drizzly Oregon day, something to excite your senses and spark your synapses. And what better way to spend a day indoors than snuggled beneath a blanket, hot cocoa in hand, eyes glued to a page? I’ll answer that one for you: none. Still not convinced? Then here’s some inspiration from your fellow book lovers at OSU Press. Grab your heated blanket, prepare the hot water, and read on to hear some of our staff’s recommended rainy day reads. I’m a sucker for historical novels and all things Oregon, so how could I not love Don Berry’s Trask? Loosely based on the life of Elbridge Trask, an early fur trapper and mountain man, the novel follows its eponymous character as he treks in the early 1850’s from the Clatsop Plains, near Astoria, to the mouth of Tillamook Bay. Trask takes the form of a hero’s journey, but this is not your typical myth of manifest destiny. The story is sensitive to the many complexities of native culture and has a strong spiritual thread running through it. It’s full of adventure and the search for meaning at the wet edge of the continent. For best effect, read it while wrapped in a Pendleton blanket. As long as we’re on the north coast of Oregon, I have to mention The Next Tsunami by Bonnie Henderson. Like a lot of other people, I have a certain… prurient fascination with natural disasters. I thought that Henderson might offer a cautionary tale, a dark vision of how our coast will look after its bays and estuaries are scoured out by the next big tsunami, with marinas reduced to match sticks, collapsed highway bridges, underwater shopping districts, and etc. Instead, I finished this book with an uncanny sense of calm and hope. Henderson tells the story of how scientists came to discover the Cascadia Subduction Zone and definitively proved the Pacific Coast’s long geological history of earthquakes and tsunamis. Thanks to Henderson’s skillful telling, this history of science unfolds like a mystery. Who knew that geologists could be such fascinating characters? What else? We have so many worthy books and authors on our list, I could go on all day, and all then all night. Which reminds me of Up all Night by Martha Gies, another personal favorite. This collection of stories about swing- and graveyard-shift workers takes readers on a guided tour of one city’s nocturnal professions. That city happens to be Portland, but it could be anywhere. Night workers live in a country all their own, and Gies is a friendly, companionable guide. "Rain slips and slides along hawsers and chains and ropes and cables and gladdens the cells of mosses and weighs down the wings of moths. It maketh the willow shiver its fingers and thrums on doors of dens in the fens. It falls on hats and cats and trucks and ducks and cars and bars and clover and plover. It grayeth the sand on the beach and fills thousands of flowers to the brim. It thrills worms and depresses damselflies. Slides down every window rilling and murmuring. Wakes the ancient mud and mutter of the swamp, which has been cracked and hard for months. Falls gently on leeks and creeks and bills and rills and the last shriveled blackberries like tiny dried purple brains on the bristle of bushes." Martha Gies guides readers on a nocturnal tour of Portland, offering fascinating profiles of the graveyard shift workers who keep our city running after dark. I grew up here and have lived in Portland for most of my life—but Gies shows a side of the city that even longtime locals haven’t encountered. It’s one of the great unsung books about Portland. An essential tome for understanding and identifying terrestrial slugs and snails in the Pacific Northwest. Know thy neighbor. Greg Nokes explores an important aspect of Oregon’s history that I don’t believe a lot of Oregonians know. That includes Oregonians who moved here like myself 20 years ago. Mina Carson’s biography is the first ever to reveal more of the personal side of the Paulings’ life together. More importantly, she rightfully establishes or acknowledges Ava Helen’s contributions to Linus Pauling’s anti-nuclear stance for which he was awarded the Nobel Peace Prize. Arguably many feel like this should have been his 2nd shared Nobel Prize. 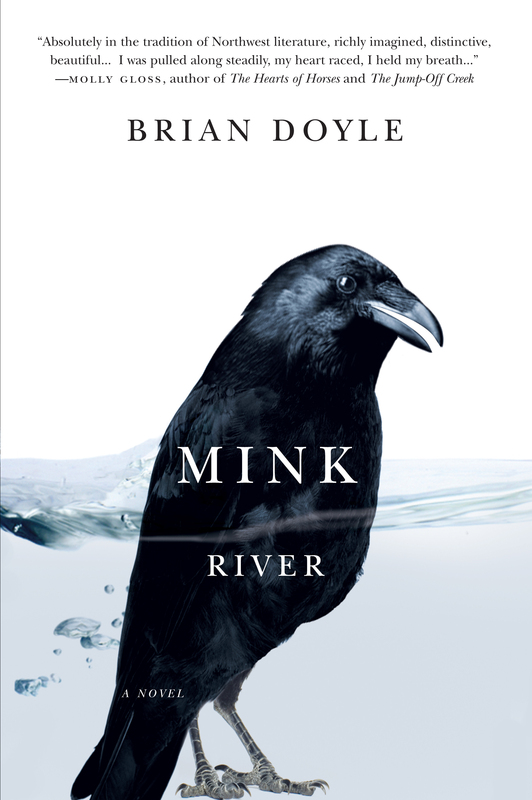 I love reading and rolling along with Brian Doyle’s lyrical prose. I would actually recommend reading this title and Kesey’s Sometimes a Great Notion. Together the two provide two worthwhile perspectives on coastal communities in Oregon albeit separated by time and imagination of their respective authors. Still looking for the perfect rainy day read? Browse our online database, read some previous blog post synopses, or request a print copy of our Spring 2015 catalog. Questions, comments, or concerns? Shoot us an email! The opinions expressed below are those of intern Victoria Hittner and not necessarily those of OSU Press. I despised the phrase “look it up in the dictionary” as a child. We’ve all seen it happen: intrepid young student asks teacher for spelling advice, only to be sent toward the giant tome on the shelf. A tome that’s alphabetized. With a student who’s questioning the letter arrangement of a word. While the illogical practice may have infuriated the obstinate younger me, it also fulfilled the purpose my teachers had intended. Each time I shuffled to the shelf, I became lost in the cadence and mystery of words I didn’t know. Flipping pages was no longer such a chore because I fell in love with the intricate English lexicon. The written word quickly became a personal fascination, one that has followed me into adulthood. And so, to appease my inner logophile (and offer silent salute to my elementary school teachers), below is a brief list of words, inspired by our Spring 2015 new releases. * Each new title has been assigned a single descriptor. It’s like our very own Merriam-Webster, OSU Press special edition. Alphabetized and all. In his latest publication, Fausch explores more than just the ecology of stream environments. Expounding upon the beauty and mystery so entangled with our world’s water systems, Fausch uses his own field experience to link fact with emotion. For the Love of Rivers explores how science connects aquatic ecosystems to their streamside forests and the organisms found there—including humans. Silviculture and Ecology of Western U.S. Forests, Second Edition by John C. Tappeiner, et al. The modern concept of silviculture has grown to encompass a multitude of important topics, adding forest health and aesthetics to traditional ideas of reforestation and timber harvest. Four esteemed forestry professors combined research and passion to create an updated edition of this comprehensive reference—the only text that focuses on silviculture in western U.S. forests. Silviculture and Ecology adds a new dimension to conservation and consumerism, showing how contemporary silvicultural practices help prevent the two concerns from becoming mutually exclusive. Brilliant thinkers from fields like history, geography, and climatology lend their knowledge to this compilation, exploring the historical connection between environment and the Japanese people. Through these essays, Batten and Brown introduce readers to the idea of continuity, challenging previous notions that pre-modern and modern environmental history cannot be compared in tandem. What fostered the modern American conception of forests and their value? Emily Brock explores this question in Money Trees, following traditional political debates to the current wilderness movement. Using the forests of the Pacific Northwest as a guide, Brock provides an interdisciplinary history of industrial and public views of American forests, adding provocative commentary on the driving forces behind political currents and forest management practices. Beloved Oregon author H. L. Davis’s award-winning work returns to print in this new edition, containing an introduction by historian Richard W. Etulain. Honey in the Horn chronicles the adventures of Clay Calvert, a young ranch hand who journeys across Oregon in search of a new start. Along the way, he meets a score of fascinating characters from a variety of ethnicities and backgrounds. Perhaps even more poignant than when it was first released, Davis’s work captures the true essence of Oregon’s pioneer spirit in a way that avoids melodrama but smacks of veracity. The verb, not the kind that grows in old, damp apartments! Jim Furnish’s memoir follows his rapid career rise through the ranks of the U.S. Forest Service at the turn of the century. Working in a field mired in controversy, Furnish struggled balancing his growing passion for conservationism with loyalty to his employer. As the department as a whole was being shaped by changing public interests, so, too, was a man molded by his environment. Offering a unique inside view to the industry, Furnish explores the pitfalls—and important potential—of the Forest Service in global conservation efforts. How did a kid from rural Oregon turn a tiny kitchen-based operation into a global manufacturer? Ken Austin and his wife, Joan, founders of dental equipment company A-dec, reflect on the journey of perseverance and dedication that led to their current business and philanthropic success. Following the renowned “A-dec way,” the Austins prove that good ol’ hard work and compassion truly do pay off. pur•pose (n.): the aim or goal of a person; what a person is trying to do, become, etc. Utopia or dystopia? Or somewhere in between? Margaret Grundstein reflects upon her time in a hippie commune in the backwoods of Oregon, living off the land in harmony with the environment and other people—at least initially. Disillusionment, rifts, and reality eventually invaded the small community, tearing apart a settlement founded on unity. Naked in the Woods explores the interrelated ideas of human nature and social change, leaving readers with much to think about beyond the final page. Evelyn Searle Hess’s latest book explores sustainable living on a personal and detailed level, following the construction of Hess’s cabin in the foothills of the Oregon Coast Range. Throughout the process, Hess determined that a sustainable life involves more than just recycled products; it requires cooperative and healthy human relationships, too. Building a Better Nest asks readers to think outside the box to ponder whether the quality of the local watershed and quality of human life are truly separate issues at all. Melinde Jette delves into the syncretic explosion that occurred within the French Prairie area of the Willamette Valley during westward expansion. Far from undeveloped during the 1850s, the French Prairie area teemed with a complex culture all its own: the Ahantchuyuk Kalapuyan people and French settlers who lived in comfortable mingled communities. This synthesis of cultures fostered a hale and happy valley, which was later disrupted by the Anglo-American pioneers’ institution of settler colonialism and racial exclusion. At the Hearth of the Crossed Races provides a glimpse of oft-unseen Oregon history and underlines the complexity of differing social values and traditions. Go Blazers! And while we do root for the red-and-black adorned basketball team, we’re talking about political trailblazers here. In A Man for All Seasons, William G. Robbins documents the incredible career of politician Monroe Sweetland. A prominent Oregonian during the twentieth century, Sweetland left a lasting legacy upon the region through his involvement with the modern Oregon Democratic Party and National Education Association. A champion of those whose voices were often marginalized, Sweetland pushed for the Bilingual Education Act of 1968 and successfully propelled the ratification of the twenty-sixth amendment in 1971. Robbins’s portrait shows a compassionate, yet conflicted, man whose passion helped shape the modern American political landscape. Compassionate people and projects exist around every corner, yet very rarely receive adequate recognition. State of Giving follows the stories of numerous civic leaders, grassroots organizations, and volunteers who make a difference every day, all across Oregon. Covering topics like hunger and homelessness, the urban/rural divide, and education inequity, State of Giving demonstrates there are ways in which anyone, regardless of background, can give back to the community. Want to learn more about our upcoming titles? You can browse our online Spring 2015 catalog or request a print copy here. *All definitions taken from www.merriam-webster.com.